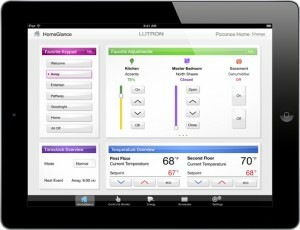 With the Lutron Home App, you can control your lights, shades, and thermostats. Lighting Automation gives you the ability to intelligently and conveniently control all aspects of lighting in your home or business. With the advent of smart phones and the internet of things, there has not been a better time to invest in a Lighting system. 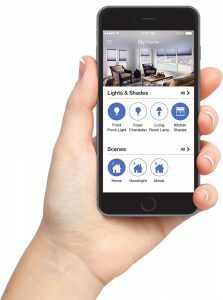 Lighting Controls systems can perform tasks as simple as turning on or off a group of lights with a push of a button, closing the shades in your house while on vacation, or integrating your lighting controls with Audio/Video, timers, shades, touch screen panels, climate controls, vacation modes, etc for total home automation. Light-Tech Inc has the certification and expertise to install and program a variety of different systems to fit your needs and budget. 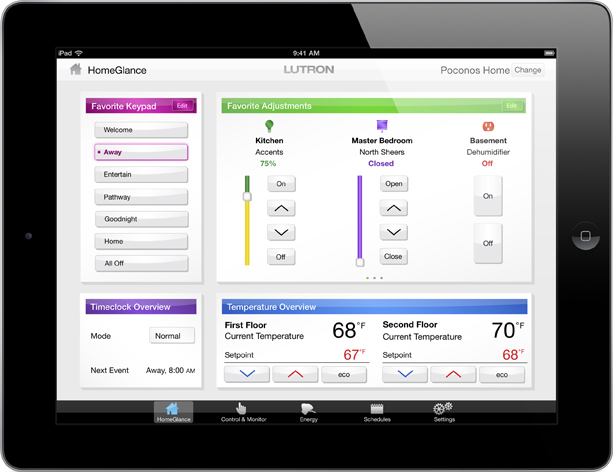 Light-Tech Inc. is proud to be a factory authorized dealer, installer, and Service representative for the Lutron’s flagship Homeworks Interactive, Homeworks QS systems as well as RadioRa 2 wireless and Caséta Wireless systems. Light-Tech Inc. embraced lighting automation from the beginning with systems from Vantage and Lutron and are always investing in keeping up with treds. We are one of the very few electrical contractors in Houston who have the factory training to work on sophisticated systems with our own in-house designers and programmers. Never come to a dark house or worry that you may have left the lights or the Air Conditioning on again. From anywhere in the world, you can control your home’s lights. While in the house, imagine starting your morning by pushing a single button by your bedside to slowly fade your bedroom and bathroom lights on, raise the shades in your home, and turn on your TV to your favorite channel. When you return home in the evening you’ll see that your landscape lights have automatically came on, and a pathway from your garage to your living room is already lit. Create the perfect mood for parties, working, watching TV, or simply relaxing by the push of a button or even automatically. Push a single button before you go to bed instead of checking every room and turning on night lights. Your imagination is the only limit to what can be controlled by our lighting systems. Which do you prefer on your walls? A clutter of random switches and dimmers or the beautiful Lutron keypad on your wall that can control any set of lights in your house. 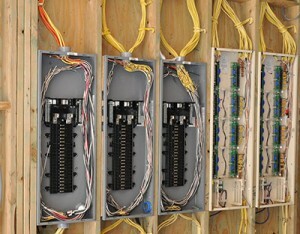 A single smart keypad can replace rows of 8 gang electrical switch box on your wall! The function of each key is engraved onto the button for physical keypads or on a touchscreen so anybody can use them as easily as they can traditional switches. Unlike Traditional switches, these keys can not only control one light but the lights for your entire home. No matter which system you choose, we offer a large selection of keypads in various sizes, colors, and finishes and you never have to look at a cluttered wall again. The best time to think about lighting automation is while building or remodeling your home. During that time when walls are open and wire can be run offering more options and choices for keypad styles and integration with other systems in your home. During construction, your centralized processor lighting system can be hard wired and fully integrated with all of your audio/video, communications, pool, lawn-care, and security systems. upon moving in, the only thing you will see on your walls are elegant keypads which can be programmed to control your entire home. If your home was not pre-wired for automation, or you currently have another system with which you are not happy with or simply want to upgrade, you still have many options to automate your lighting or your entire home with very few if any limitations. We have several wireless system choices for you which will use RF signals in place of the hard wiring to communicate with the processor. We simply install a wireless processor inside your home, replace your existing dimmers and switches with our radio controlled dimmers and keypads, and program the keypads with different lighting scenes, transforming your home into a modern marvel. There are many reasons to upgrade your existing lighting system. It could be because your current system is just not advanced enough for your needs and you want to take advantage of the latest technology such as smart phone apps or cloud integration with a home assistant like the Amazon Echo. Perhaps you are tired of the older style keypads and want to update to a more contemporary look. We can help by checking whether we can add the capability to your current system and if that’s not possible, find the best upgrade for your current setup. If you have an older Lutron Homeworks , classic radio ra, or Vantage, we can upgrade you to Homeworks QS or Radio Ra2. Of course, nothing lasts forever and if your old system has worn out or failing components and replacement parts are no longer available or too cost prohibitive, your best option might be to replace your entire system. For these types of upgrades, our goal is always to use as much of the old wiring and other system components as possible to minimize damage and cost of the project. Being certified with the industry leading lighting systems from Lutron allows us to provide you with replacement options for your older LiteTouch systems that are factory tested and UL approved. Even if you have much older lighting systems or even older relay systems, we can provide you with upgrade options to to bring you up to cutting edge technology. By law, only a licensed electrical contractor may install the high-voltage wiring for any electrical system. Most electrical contractors do not know the first thing about lighting controls systems and simply do what the Audio/Video company has instructed them to do without having any knowledge of the system. On the other hand Audio/Video companies are not electricians and do not have the right qualifications to understand the electrical needs of the very specialized lighting, load calculations, ballasts, and transformers which are used in today’s sophisticated homes. Worse yet, audio/video companies often needlessly integrate lighting with audio video so much that one can not be serviced without needing to service the other. In a few years when you need to service your electrical and/or lighting, it can become a nightmare as you have no choice but to call them for repairs. That is of course, if they’re still around – otherwise, you could end up having to find someone who is certified to work on the various systems they installed in addition to an electrician! 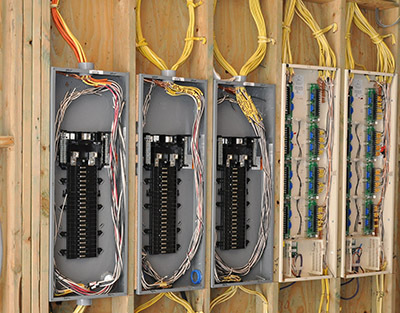 In contrast, Light-Tech Inc’s installers and service technicians are state licensed electricians and are not only experts in the low voltage wiring and programming of home lighting automation systems, but also the high voltage wiring that only an electrician should service. In addition, we have chosen the products we endorse very carefully and you can be assured that they will do every task that we claim they can perform, you can find parts for, and most importantly, service or upgrade in the future. There are many inferior products in the market today which fall short of what they promise or are incompatible with your home’s wiring or light fixtures. The products that we recommend are from Lutron and will provide you with years of great functionality. We have a solution for every budget and house size from the DIY programmable Caseta and dealer installed and programmed Ra2 Select systems to Radio Ra2 and Homeworks QS.